This Is Nuts! No Nuts in Chock Full o’Nuts? 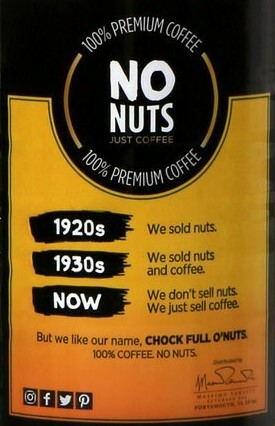 Inexplicably, the folks who have been selling us Chock Full o’Nuts coffee for roughly 80 years have decided to fess up. Their coffee is not chock full of nuts. In fact, it has no nuts whatsoever. The new packaging says so. Boldly. Right on the label. Chock Full o’Nuts is a New York thing. People in the city grew up with it, know the jingle – Heavenly Coffee – and presumably they know it has no nuts in it. Every time we’ve done consumer research on why some people do not purchase the product, the No. 1 thing that comes back to us is there’s something in the coffee. said Dennis Crawford, the senior marketing manager for Chock full o’Nuts. Most of the people in New York — we’ve been there forever and they get it, but if you’re in Omaha and suddenly we’re on the shelf and you see the brand for the first time, there’s confusion. Thus we have the full-o-nuts-no-nuts disclosure, along with a little history lesson. Did you know that when Chock Full o’Nuts shops started selling coffee in the 1930s, they sold cream cheese and chopped nut sandwiches on dark raisin bread to go with it? All for a nickel. Whatever the history, this is beverage marketing we can believe in. Research points to more good than harm from drinking three to four cups of coffee a day. And this brew is as good as any. Besides, we like our coffee here at ConscienHealth. And if this disclaimer helps the cause, more power to them. Now, maybe it’s time for Red Bull to explain that its dubious product might give us a caffeine buzz, but it surely won’t give us wings. On the other hand, Chock Full o’ Nuts gave Jackie Robinson a job when no one else would — he became the first black VP of a major US corporation. So I’m willing to cut them some slack on the nuts.